Paris: The Street is Ours! Lots of traffic in two lanes, and a lane reserved for buses and two-wheels conveyances. Yes, the bus lane is empty at the moment, but this demonstrates the great and damnable paradox of bus lanes: If buses are moving well, and carrying more people than the car lanes, the bus lane looks empty most of the time. 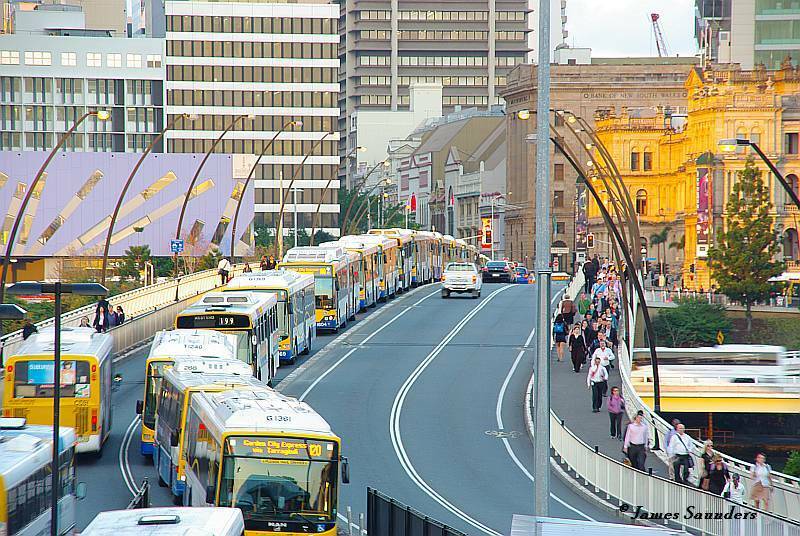 Only a failing or obstructed bus lane looks like it’s full of buses. That’s why bus lanes are such a hard sell in cities run by motorists who want to do the green thing but still form their impressions from behind the wheel of a car. But in the last two decades, while a few American cities have had long arguments about converting single lanes to bus-only, Paris just did it. Not here and there. All over the city. Name your favorite Paris boulevard, and it probably has bus lanes now. And they’re really nice buses, where you can board and alight at all doors. One key to the Paris project is that these are not just for buses. They can also be used by taxis and all two-wheeled vehicles. This is a manageable range of vehicles that all serve urban mobility more efficiently than the private car, and that don’t usually generate enough congestion to plug the lane for any length of time. Now and then, something else shows up in a bus lane, such as here on Blvd. de Clichy in front of the Moulin Rouge. But still, the buses get through. What about smaller streets? Surely when you just have two lanes of traffic, you’d never take one of them — half of the entire capacity of the street — for a bus lane, would you? Of course you would. Have a look at Rue du Faubourg St. Denis, climbing the gentle grade from Les Halles to Gare du Nord. Without that barrier in the middle, you could have striped this one-way street as two traffic lanes plus a parking/delivery lane on each side; in fact, if I probe my dim memories of living in Paris in 1986, I think that’s what it was. But they not only carved out a wide bus lane but also a solid median curb to protect it. (These curbs are sensible because motorists know not to drive over them but emergency vehicles still can.) The resulting wide bus lane is important because it’s shared with two-wheeled vehicles — bicycles and motorbikes and scooters, and these need the ability to pass the bus without interacting with parallel traffic. Note that the direction of the bicycle path matches that of the street, the norm in Paris. Car traffic still has one through lane and an intermittent delivery/parking/turning lane. It’s also increasingly common, on larger boulevards, to see separate bicycle and pedestrian spaces in addition to the bus lane. Typically, the large boulevards have always had small frontage roadways on each side used for accessing on-street parking. These roadways now also serve bicycles, and are connected by appropriate bike-only segments. There is still a sidewalk/footpath for pedestrians as well, against the building face, though nobody worries much about enforcing ped/bicycle separations. Further encouragement for both cycling and motorbikes comes from the abundant supply of parking areas for “2 roues” — two-wheels. The sign means that you’ll have to wait for one signal to cross to the median and then another signal to cross to the far side. A pain, but then again, signaling the two phases separately gives you more opportunities for signals to be green. This is useful if, like me, you’re willing to cross on a red if it appears safe. That way, you still get the assurance of the green for half of your crossing. Last year when I passed through Paris, I encountered a funny bit of sculpture in the Rue du Chat qui Peche (“street of the fishing cat”). Those words are at least as old as the French Revolution, but they’ve never been truer in Paris than they are today. We are a long way from the Paris of the 1970s, when planners imagined freeways on both sides of the Seine, and new extra-wide bridges for more car traffic. Today, Paris is for human beings, but you don’t become human in this city until you get out of your car. As soon as you do, the street is yours. paris: "the bus stop of the future"
33 Responses to Paris: The Street is Ours! At many computerized intersections with traffic detection loops, the pedestrian signal may stay green for only 5-10 seconds, then start blinking red and go to full red, even if no traffic is approaching from any direction, and the car signal in the primary direction remains green. The goal appears to be to give a car coming from the secondary direction a faster green. And I quite agree that in many cases it takes a full cycle before a pedestrian will get a green again. The signal designers appear to prioritize efficiency for autos far ahead of pedestrians. And while in New York pedestrians cross whenver they feel it is safe, in other cities such as Seattle the police will still give pedestrians citations for jaywalking if crossing on a red signal even if there is no traffic. NY has painted dedicated bus lanes on streets like 42nd St and 34th St in Manhattan. These bus lanes constantly are blocked with parked police cars and delivery trucks. If the police don’t respect the bus lane themselves, how can they enforce and how can they expect others to respect it. Paris definitely has done bus lanes right. Wonderful that the default for the ped signal is green! Thanks for that fresh nougat there. …Of course, the travel lanes of Parisian boulevards always used to be Ped-green by default. For a great example, just check out this classy number. I’ve never understood why American WALK signs have always been white rather than green, yet one of the pictures above does seem to give the impression that the green might be less visible than a brighter white would. Another fun fact about NYC pedestrian signals: there is no manually operating them. They simply change to WALK at every signal. You do occasionally come across an old Walk button at an intersection, but I am pretty certain they are out of order. In other cities, I have never been certain that pressing the Walk button actually had any effect on the signal despite the expectation presented by the existence of the button, so it makes sense to me to just do away with it. Usually when a button is provided for pedestrians, there is no automatic walk for pedestrians in the signal cycle and there will be no walk at all in that direction unless the button is pushed. In other words, the default cycle is for autos in the “primary” direction of traffic, or for alternating directions. What if the default mode of operation was a Barnes Dance cycle (red for all auto directions, green for all pedestrians), and only the presence of autos for sufficient time gave cars the green? Honestly, it’s been so long since I’ve lived in a city where the buttons supposedly did something, I can’t remember how it worked. I grew up in a smallish city (Rochester, NY), and I know I was conditioned to push the darn button at every corner – I don’t recall what would have happened without pushing the button, but if the result was the usual green light for cars but a DONT WALK for me… well, that just doesn’t make much sense. I used to think the point of the button was to shorten the current cycle in favor of the pedestrian, but that doesn’t make sense either because it would disrupt the constant “flow” that traffic engineers like so much. I live in Chicago, a city where the pedestrian signal automatically changes to white at every intersection. Very occasionally, you find a place where you have to press a button, but they are usually school or library crosswalks in the middle of blocks. Living in Buffalo, NY for the summer, the experience is far more typical. At every corner, you have to press a button. Buffalo is not built on a grid or any other perceptible pattern, so at many corners you have to cross twice to get to the other side. In addition, some of the lights at major streets take 2-3 minutes before giving a ped signal. Most peds, of course, don’t use them at all, and just watch for a green light in their direction of travel – though the lights are hung from the center of intersections, which makes it very hard to see them as a pedestrian. For smaller, auto-centric cities such as Buffalo, a very simple and cheap strategy to improve the pedestrian experience would be to do away with the buttons and make the ped signal appear on every cycle. Showing the signal or not does not seem to change the cycle in any way, so it shouldn’t matter to traffic flow, if that’s what traffic engineers are concerned about. Almost every intersection in Boston has the buttons. After living there for 4 years, you learn that every single intersection is different, and you learn how to “use” them. There are no directions, you just figure it out. Intersection A- Exclusive pedestrian phase, automatically active 6am-7pm every day. After those hours, the button must be pushed to activate phase. No instructions on these hours. Intersection C – Button does nothing, ever. Now Im in california. 95% of intersections require pushing button. Some intersections, nothing changes except the walk person appears. In others, the light defaults to red for the cross street, so the button (and bike loop, and car loop) allow crossing. Yet another intersection increases crossing time, so old ladies can make it across the 10 (ten) lanes. Whats interesting is that after 11pm, most signals around the city default to red (all directions) so buttons and loops are needed to tell the light to turn green. I’ve long since thought that the Parisian transit experience is one of the world’s best. I spent a few months there in 2005 and then again in 2008, and within those 3 years it seemed every street had gained bus lanes and some form of bike infrastructure or traffic calming. Not to mention Vélib and the great improvement of Navigo fare collection in this short time span. My one beef with the article is the insinuation that taking one lane from a two-lane, one-way street could reduce capacity by one-half. A second lane does not double capacity, except possibly in the scenario where all cares are stopped. Drivers require lateral clearance as well as clearance in front and behind. That is, drivers can drive more closely to each other in single-file formation. So taking away a lane isn’t so bad. Amazing! I have occasionally dreamed of a world where intersections stay all-way “walk” until a car waits its turn for a green light, and here you tell me that a place like that actually exists! Button-triggered walk signals should be banned. No traffic signal should ever give cars a green light without simultaneously giving pedestrians going the same direction a walk signal. Most of the car running in inner Paris are people living in suburbs and if they use their cars, it is often because they don’t have good public transport or don’t have public transport at all. To have a policy against the car, you also need a real pro transport policy and it is not the bus lanes, little LRT or Velib that will help the million of suburbanite. It is expanding the metro furter in suburbs, creating new lines of suburban train, improving the existing services. Unfortunely the few project are not enouth to solve the problem. The result of Delanoe (inner Paris mayor) policies is an increase of the segegration and the worsening of the commute time for most of Paris metro area inhabitants. We seriously need a greater Paris, a city where most people could vote for the mayor and not a city where an handfull of privilegied people can aggravated the life of the majority of the population like today. Do all of the streets have separate bike lanes, and if not, is there a problem with the buses and bikes sharing lanes? Do the buses have to drive around the bikers to pass them? And the buses are always pulling over for stops. And the fumes. I agree. I have no idea where the push the button concept ever came from. The only usefulness I can see in it, is if it makes the green cycle longer for people with physical difficulties in crossing. Susan. Separate bike lanes are provided wherever there is room, but some cyclists still ride in the bus-taxi-cycle lane because it is faster. Bus lanes appear to always be wide enough for a cycle to pass a stopped bus. Note also much wider stop spacing for buses in Europe, generally 400m more, so there is less leapfrogging of buses and bikes than you see in North America. Paris doesn’t really have a metro area-wide government. The Ile-de-France region has some responsibilities, such as funding transit, but most government planning functions are local. It works insofar as Paris transit is coherent, but it doesn’t improve the degree of segregation between the city and the suburbs. In Tokyo, the closest thing to a metro area-wide government is the national government of Japan. What you may be thinking of is Tokyo Metropolis, a prefecture that consists of Tokyo and a small chunk of suburbs, and contains one third the population of the metro area. re: traffic signals: I’ve seen buttons in both Tel Aviv and Singapore, but I believe the light eventually turns green for pedestrians regardless. In Singapore, I think that pedestrians get the cycle together with cars driving in the same direction, but I’m not sure. In Tel Aviv, they often don’t; on median-divided streets, as I keep mentioning, the two halves of the street give pedestrians the green light at different times. Pushing the button: It’s even worse. As far as I know, most buttons don’t do anything at all (like “close the door” buttons in elevators) but serve as a collection point for pedestrian data. The ‘click’ statistic is used to program or influence the light cycle. Probably not even that if the intersection is complicated enough. In Germany the pedestrian signals, whose buttons actuate the signal immediately, have an additional light that says “Green is coming”. The RER and other suburban train services are “good” but clearly not enouth to serve the vaste suburbs of Paris. The existiong are already really overcrowded in rush hour. Many people don’t have the choise to take their cars and it is them that Delanoe anti-car policy affect. The bus serving the central Paris almost never go outside the Peripherique, so the bus lanes created only improve the bus service in an area (Central Paris) where it is not so much necesary as there are the metro everywhere. Unlike Paris LA have big boulevards everywhere, in Paris suburbs the only big streets lead to Central Paris. Delanoe (City of Paris mayor) need to understand that Paris proper is only the center of a big metropolis and not an independant city. The Ile de France budget is ridiculously small. It is already not enouth to completly renovate the transit system. There are many subursb with 60,000 to 16,000 inhabitants per square mile that doesn’t have any efficient rail link. Of course the money is not properly divided. There are a lot of articles on Curitiba, Brazil’s bus system. I was there as an LDS missionary in 87-88. At the time, I was amazed that the express bus lines had dedicated lanes as you’re describing here. They worked quite well, and the express buses came every 10-15 minutes. You can get anywhere in the city via the express, rotary, and neighborhood buses. Actually in Paris motorbikes and scooters are not allowed in the bus lane but many disregard this law. You risk a 90 EUR fine. Bike enthusiasts are trying to change the law to allow motorbikes on it. Bicycles are allowed, some bus lanes are narrow and sometimes the bus has to stay behind the bicycle at the same speed, which is a huge pain for the bus and the bicycle. I’ve been cycling for 3 years everyday in Paris. I just love it. It’s the greatest way to move I’ve experienced in almost 30 years in the city. It’s sometimes a bit hard to make pedestrians understand that a cycle lane on the pavement should be respected, but things should get better with time. Cycles are not welcome in the bus lane. The bus and taxi drivers just hate them and are often agressive. It’s even worse for roller skaters. Paris has a tradition of organized roller skating events in the streets (every Friday for the most famous one). But skaters have no legal status yet and when they use the bus lane, the drivers tend to “push” them out of the road. The other problem with the bus lanes in Paris is that there are so many people stopping on that lane “it was only for 5 minutes” that busses often waste a lot of time reinserting into the car lane through the separation curb or just wait for the car driver to come back. Minato, my admittedly limited experience with the RER is that it’s not overcrowded, due to the bilevel cars used on the RER A. The single-level cars are overcrowded, but that’s due to poor design; the seating is intercity train-style with narrow corridors, leading to overcrowding in the standing areas near the doors and nearly empty corridors. The Ile-de-France budget for transit is limited, but there’s a lot of money going directly from taxpayers to STIF. There are plans for Métro extensions to the inner suburbs, a westward extension of the RER E, a circumferential RER line, and a few trams. Are those not yet funded? I thought the money was already committed, but I’m not sure. 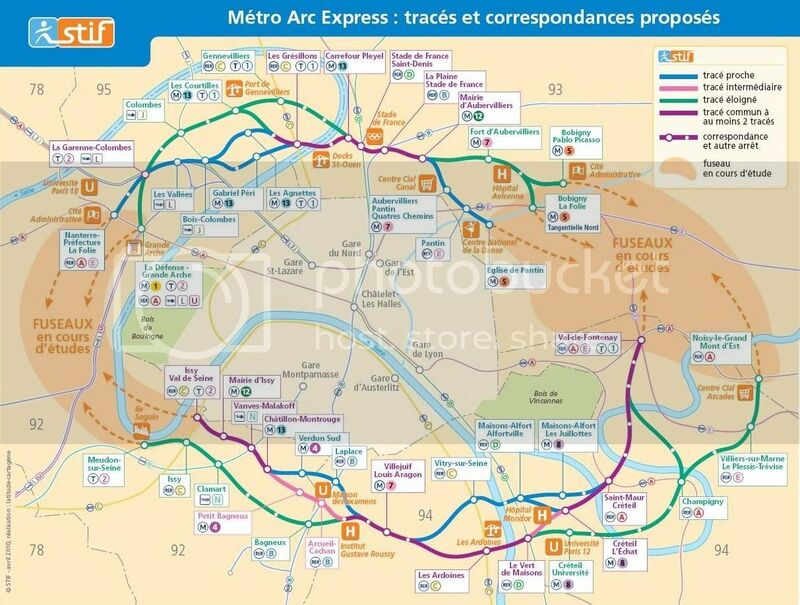 The Arc Express metro ring line is a very good and necessary project (we need it) it will link area where the transport already exist and will improve the inner to inner suburbs transit. This line as the western RER E will not open before 2020. The few metro extention are only a few kilometers after the Peripherique, it is not enouth for the big suburbs of Paris. The metro need to far further, at least at the beginning of the fare zone 4. Only the eastern line 8 go far enouth serving Créteil. Some business districts like Velizy (southwestern suburbs) were planned and built in 1970’s for the metro (extention of the southern line 13) but the metro never arrived and was remplaced by a slow under sized tram project. Worse this tram will be rubber tired Translohr(a failed technonology). About the RER A, doubledecker cars are bad, unlike what people believe these increase the issues on this line. Why ? Because if it is true that the MI2N (double decker train) have higher capacity but these also have higher board time and decrese the frequency. So the number of train running. That’s why the commuter trains in Tokyo are not double decker. I’ve heard that the reason why the Paris Metro was never extended into the suburbs was due to the fact that the stations within Paris are too closely spaced together, and that extending the line length would make the Metro rides too long. Is this true, or is it just an excuse not to go through the expense of extending the Metro lines? If this is an actual problem, Paris would seem to be unique in having it (never heard this used in London or Tokyo, which also have stations fairly close together). I’ve never heard this argument used elsewhere. Any chance of new RER lines being built? Like Line “F”, to connect Argenteuil to Rambouillet via a new tunnel through Central Paris? I think we have the opposite problem in the U.S. with transit, we build ridiculously long transit lines to distant suburbs and neglect core capacity. Part of this is politics (concentrating on the city center wouldn’t be “fair”), and part of it is the idea that transit should exist as a way to move commuters into the city in the morning and back into the suburbs at night (an idea left over from the 1970’s). Thank you for this wonderful piece on Paris. I had the good fortune to visit Paris last year and was amazed to see Velib cycles that have not only been a great innovation but also helped to sensitize other vehicles. Paris BRT (Mobilion) are also very human scale and seemed to work well despite sharing their lane with cycles and taxis. Your comment about empty bus lanes is also most apt.Thanks again. It’s partially due to the need to fund transport at a regional level. Suburbanites would become upset if they see their tax dollars going to “those people” in the urban area while they derive little in terms of direct benefits. I’m biased as a suburbanite, but I don’t necessarily see what’s wrong with that concept given that there are some of us who prefer single family housing, but want to use mass transit to get to work. 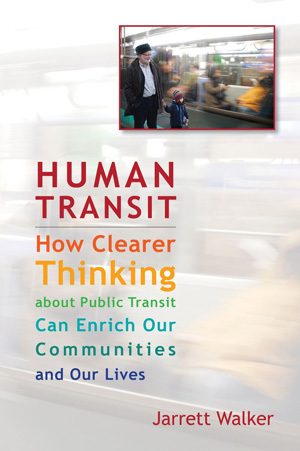 Given the the ultimate goal is to reduce car usage and promote urban living, it may make more sense to develop this urban core to suburban core transit to reduce the need to widen highways, and re-allocate urban parking spaces for suburban commuters for urban housing and commercial development. In addition, the suburban transit outposts can serve as mixed use areas for those seeking somewhat cheaper housing and commercial, but in a denser character outside of the city which can boost property tax revenues for suburban jurisdictions and serve as a nodes for reverse commuters. Mind you, this is not to say that inner city transport should be neglected. We simply need both to leverage the usage of public transport. Otherwise, you’re left with suburbanites dumping their cars in urban cores and transit activists wondering why this keeps happening, or urban residents wonder why they’re stuck with awful bus service while the suburbanites get the shiny rail services. Minato, the RER A has bigger problems with space than with loading. So RATP decided to make a compromise: the bilevels have three pairs of doors, with bilevel seating in between. Single-level with metro-style seating would be even better, but RATP and SNCF are happy with their commuter-style seating, and don’t want to change. At most, they’re willing to have one out of two decks with longitudinal seating and another with 2+2 seating. Dan78, the average interstation in Paris is about 500 meters, compared with 1,250 in London and Tokyo. This is why the Metro couldn’t be extended deep into the suburbs, forcing RATP to build the RER. The RER has longer average interstation than postwar US subways other than BART, but shorter than US commuter rail. There are plans for two core lines, F and G. F is a link between Montparnasse, which is the only one of Paris’s six intercity terminals not that isn’t yet connected to the RER, and Saint-Lazare. But the proposed alignment is awkward, since both the Montparnasse and Saint-Lazare commuter networks head west, so the RER F would be C-shaped instead of a straight line like the RER A or B. As a result, it may not be built. G is a brand new circular line, running fully underground, outside Paris city limits. It’s way more expensive than F, but because the possible alignments are more useful, it’s already on the medium-range construction plan, whereas the F isn’t. There are no plans for new RER lines, the fantasy map of Wikipedia is just imagination. This map create RER lines or branch using the existing suburban non RER train. There are no need of new expensive tunnels in the center expecially if these RER use existing suburban tracks in suburbs. I never heard of the RER G fully underground in the suburbs. The only RER G that I heard is on the fantasy map of Wikipedia. In this map the RER G use EXISTING track. It is the suburbs that need new route not the center. It is expecially for the inner surburbs (zone 2 and 3), areas with high density without a good transportation coverage. Nothing exclude to build the metro with higher interstation in inner suburbs. It would be still far more fast and efficient than the bus or the tram and only slighly slower than the RER. The best project planned is the Arc Express, a ring metro line planned in inner suburbs. It will serious improve inner suburbs to inner suburbs transit. This ring line would even more efficient if the other métro lines go further in suburbs. Minato, the Arc Express project is the one that Wikipedia calls the RER G. It’s fully underground, but to my understanding it’s designed to be RER-compatible, not Metro-compatible. The problem with the Metro interstations is what happens in the inner city. Even if the interstations were longer in the suburbs, the trains would still make too many stops in the city. Between La Defense and Vincennes, the RER A makes 6 stops; Line 1 makes 24. This makes Line 1 useless for suburb-to-suburb commutes, or even for commutes from a suburb to the wrong side of the city. Half of the lanes? Two of the most important roads into the centre of Helsinki have a bus lane, a car lane and a tram lane in each direction. That is two thirds. This is probably the most important traffic policy decision ever made here and was made in the 70’s. The problem now is that we lack the courage to do this to more streets, which are equally congested. I personally support a policy of at least one dedicated public transport lane for every street which has a) more than one car lane in a given direction and b) significant public transport or potential for it. Home › General › Paris › Paris: The Street is Ours!